We love speed… and after reviewing the Samsung 840 Pro, we were chomping at the bit to get the 840 EVO in the lab. Not only does the newer EVO model use newer 19nm 3-bit Triple-Level Cell vs that of 2-bit MLC found in the 840 Pro, but it also features a much more attractive price-point and an increased IOPS… on paper. 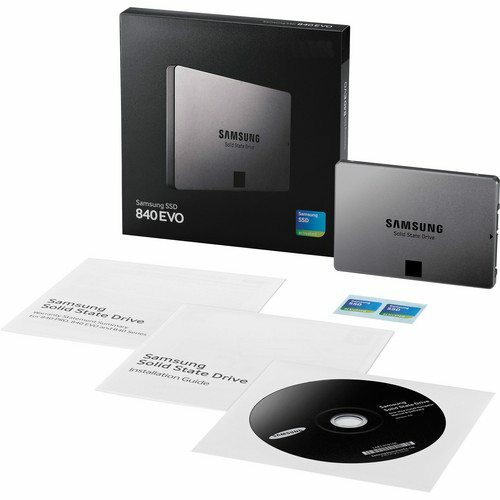 Samsung’s 840 EVO comes in a variety of flavors: 120GB, 250GB, 500GB, 750GB, and 1 wonderful TB. The 840 Evo measures in at just 7mm thick, conforms to the 2.5 inch form factor, and sports Samsung’s 3-core MEX controller. Samsung claims that the EVO can reach sequential read speeds of up to 540MB/s and sequential write speeds up to 520MB/s in their specifications. The drive sports a MTFB of 1.5 million hours and a 3 year warranty. If you do the math, 1.5 million hours is equal to 171 years! Basic (Drive only), Laptop Upgrade and Desktop Upgrade kit. 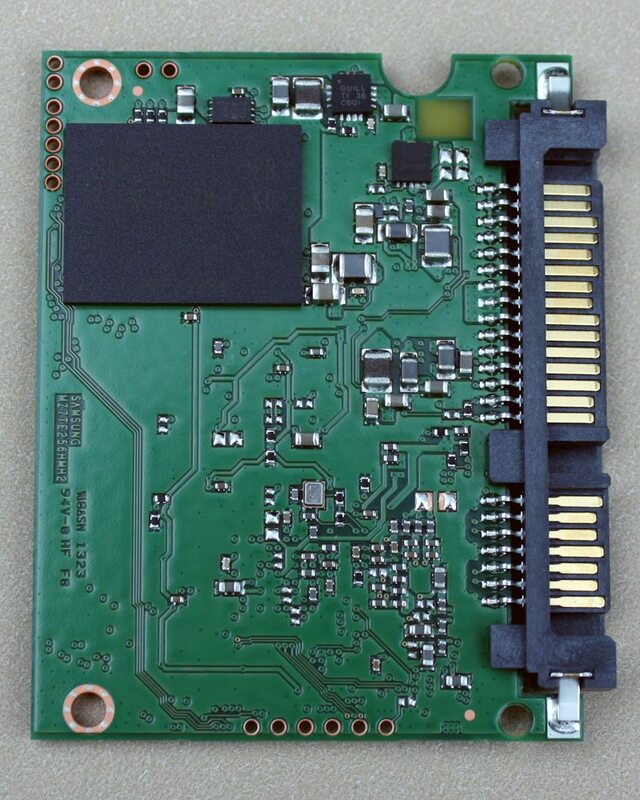 The Laptop Upgrade kit comes with a SATA to USB 3.0 connector and a mounting spacer. The Desktop Upgrade kit includes a SATA to USB 2.0 connector, a SATA data cable, screws, a 2.5” to 3.5” adapter bracket. The EVO comes in rocking the same smooth finish found in the PRO model. The sleek grey and black exterior exudes confidence. 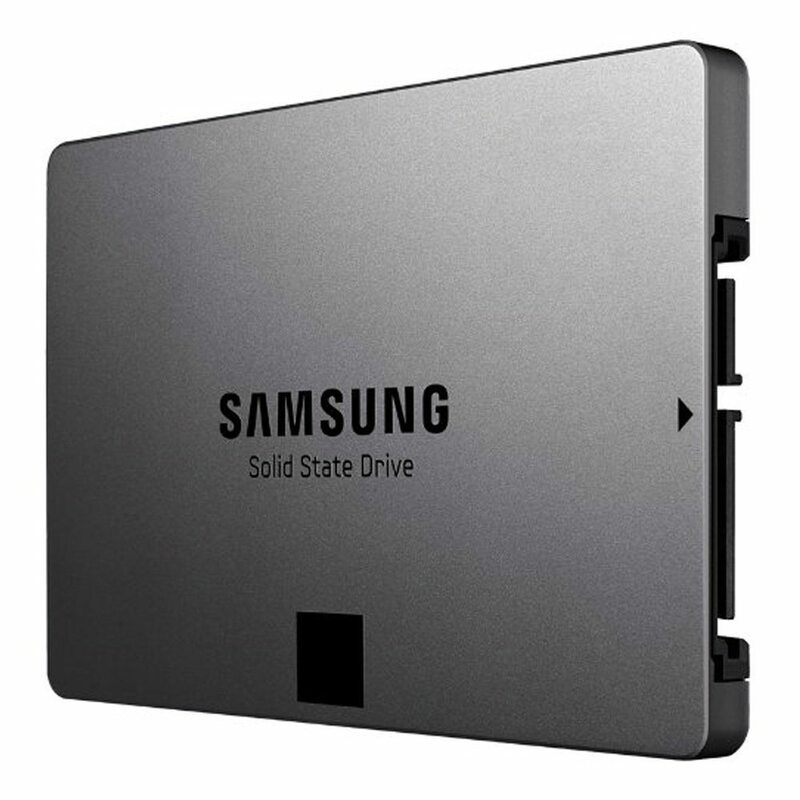 Unlike our OCZ Vector, this drive is light, tinny, and free from graphics. I do, however, appreciate the sold feel I get from the Vector; that is if feel means anything to you. The Samsung EVO looks great, but “feels” cheap. When handling the drive, it almost seems like the components inside are flopping about. Inside the EVO, there is a lot of open space. The PCB takes up just a fraction of its enclosure. 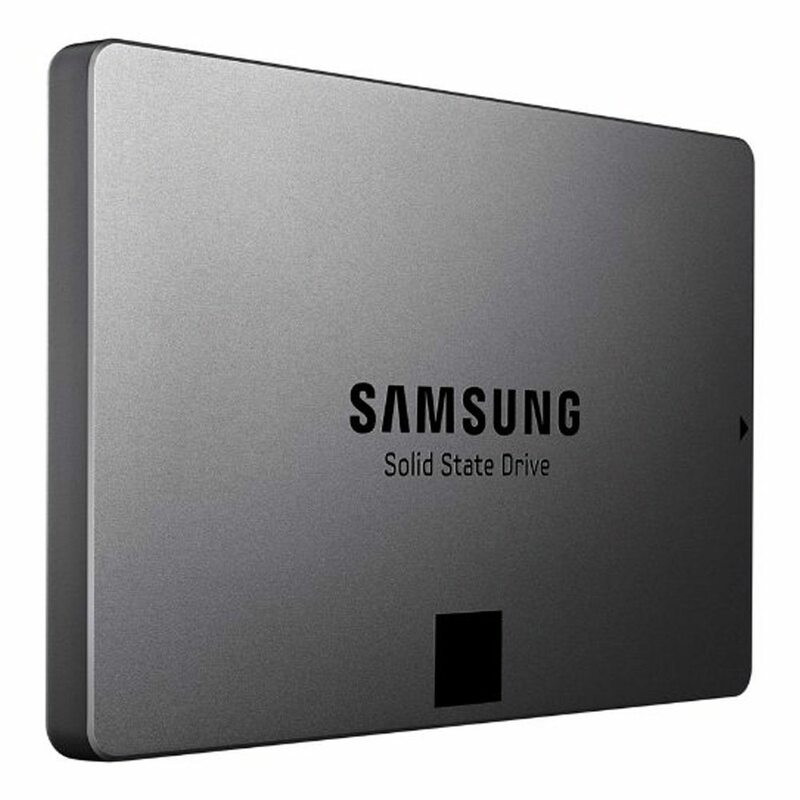 Samsung outfitted this drive with two 3-BIT MLC (A.K.A. TLC) 128GB (K90KGY8S7M-CCK0) packages, the Samsung MEX controller (S4LN045X01-B030) , and LPDDR2 DRAM for caching (K4P4G324EB-FGC2). 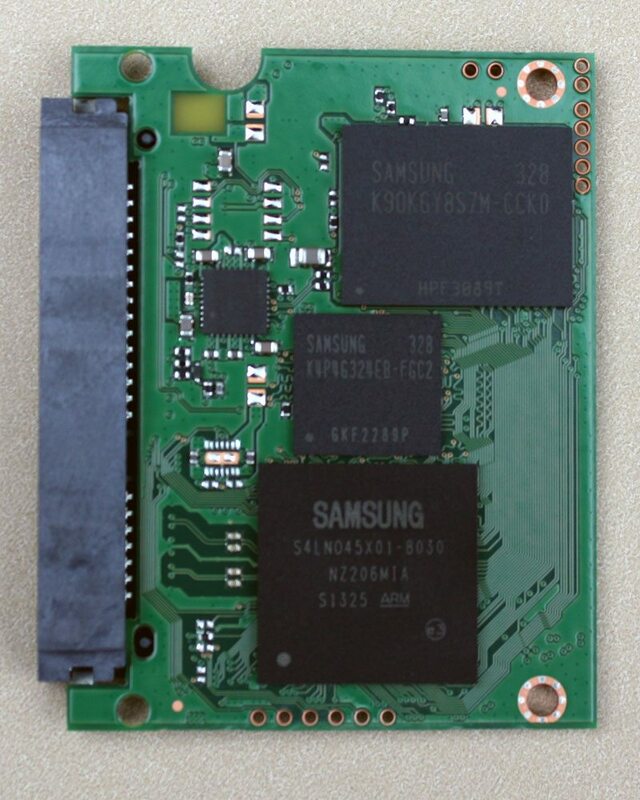 The MEX controller uses a 3-core ARM Cortex R4 processor at 400 MHz. The Cortex R4 processor is the first real-time processor based on the ARMv7-R architecture.